So, I made a mistake. I made this fabulous fruit salad several months ago, and promptly forgot about it. When I found the photo this week, I just knew I had to blog about it before it was too late. Before all of summer’s fresh fruit is gone. And I know that may be sooner, rather than later, but I just had to share. I hope you understand. This Honey-Lime Fruit Salad is absolutely fantastic. I’m not used to making dressing for fruit salads, but it’s definitely something I can get used to doing! The dressing is sweet, fresh, and tangy–sweet with honey and brown sugar, fresh from the mint, and tangy from the lime juice. Tossed with the fruit, this salad is light and sweet–and the perfect complement to your next brunch or any meal, really. You can make it with whatever fruit you have on hand or what’s fresh and available, and then whip up the dressing before serving. This is definitely an easy and yummy side dish that I will make again and again. 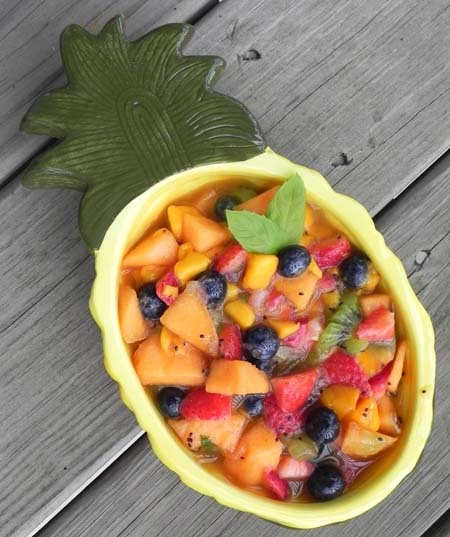 Reader Question ~ How do you dress your fruit salads? Prepare dressing by whisking together the lime juice, mint, honey, and brown sugar. Peel and chop fruit, then toss with dressing. Garnish with extra mint. Can be prepared in advance but if you include berries or brightly colored fruit [i.e. watermelon], wait to add until serving as they may bleed. Mmmmm! So happy you did share this! It sounds so delicious! Tomorrow calls for a trip to the store for mint and fresh fruit. As always, thanks for the recipes and inspiration Sarah!